It is now two weeks since the World Series of Poker Main Event set its November Nine, and big poker tournaments have been relatively few and far between, especially in Europe. Thankfully that poker drought is set to come to an end next month, and in some style. 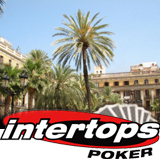 The Estrellas Poker Tour in Barcelona has every chance of setting new attendance and prizepool records, and Intertops Poker is giving players a chance to win a great poker package to the Spanish city. Satellites begin this week from as little as $2.20, with Saturday's $50+5 final to award at least one package including accommodation, travel expenses and a seat in the €1,100 main event, which begins on August 16th. Last year's main event in Barcelona attracted more than 1,700 players, a Spanish record, with the top four finishers each walking away with a six-figure payday. Even a min-cash of €1,320 would be some return on investment for any player qualifying through Intertops Poker satellites. Satellites start tomorrow and run all the way through to Saturday, so there will be multiple chances to qualify, but you've got to be quick.